The school supply lists can be found in the Parent Resource Section. Please note that the school is providing pencils and glue sticks for the students this year. 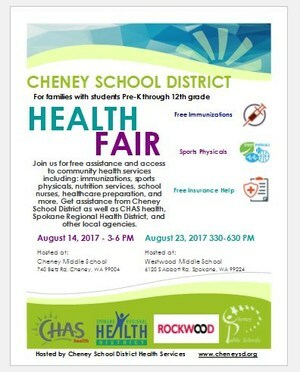 CMS and WMS will be hosting free health fairs, including free sports physicals and immunizations, just in time for school and fall sports. Click on the headline above to download the flyer. Click the headline to view the information. Cheney School District will make up our three recent snow days on Friday, February 17th, Thursday, June 15th and Friday, June 16th. The last day of school for the 2016-2017 school year is FRIDAY, JUNE 16TH. This day it will be an early release at 11:30. Please call Betz main office if you have any questions or concerns, 509.559.4800. Summer Summit 2017 May 26th, Space is limited. Registration for Ready for Kindergarten held at Snowdon Elementary. Registration closes March 20th. Click above to download Registration. We have many, many coats in our lost and found. All items will be donated to charity March 10th.